Well, the 15th annual AGBT meeting certainly didn’t disappoint. Marco Island has always been a great conference for sequencing technology, but it was refreshing this year to see that much of the conversation has shifted away from the sequencing instruments themselves and toward other critical pieces of the workflow. Several plenary presentations discussed the challenges of data analysis, the need for faster computational algorithms, and the importance of affordable alternatives to local compute infrastructure. One of the most anticipated talks of the meeting was from David Jaffe of the Broad Institute, who presented data produced by the MinIon and provided by Oxford Nanopore. However, the presentation did not cover genome sequencing with the device, so some attendees are hoping for more progress in the future. An excellent presentation came from Daniel MacArthur at Harvard and Massachusetts General Hospital, in which he talked about the analysis of genetic variation from an exome data set of 57,000 people. The interesting part was Daniel’s “57,000 + 1” problem — that is, how does it help to have this existing data set when every time you want to compare a single new exome to it, you have to run a massive all-by-all comparison again? It’s way too resource-intensive and time-consuming, especially if you’re thinking about clinical applications. We think more people will start looking to the cloud for their mega-scale genomic analysis and annotation projects. Many attendees came to our lanai suite to find out more about how the DNAnexus platform can ease their computational resource headaches. It was great to hear that lots of people were already familiar with our Baylor College of Medicine collaboration for the CHARGE consortium data and were eager to learn how a similar cloud-based approach could work with their data. 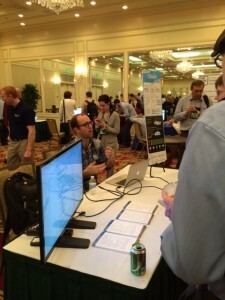 One of the conference highlights for us was the new software demo event, which was held at the nearby Hilton. 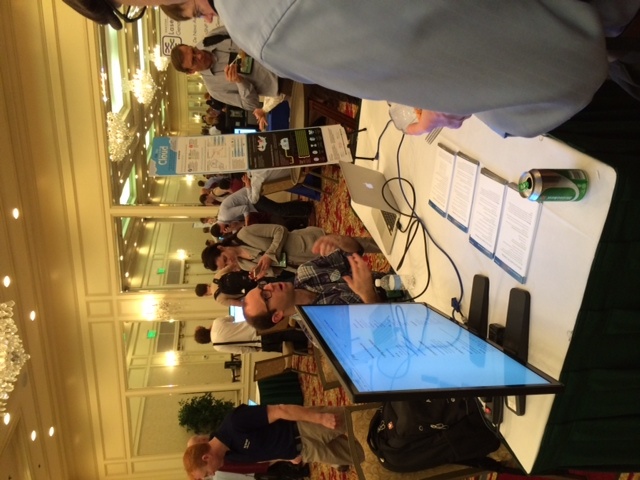 Our scientist Vince Ramey spent two solid hours showing off the DNAnexus platform to a jam-packed booth of attendees. Many thanks to the attendees who met with us, and to the conference organizers for hosting such a fabulous event. We’re already looking forward to AGBT 2015! Previous Previous: Marco Island, Here We Come!